Standby generators are there to help you in an emergency. In order to keep those emergency appliances running, you need to keep them maintained. Ordering professional maintenance can be risky if you don’t know what to expect, but we want you to find maintenance work that you can trust. When searching for Mountainside standby generator maintenance, keep the following questions in mind. When inviting anyone to come and work in your home, you want to know that they come from a reputable company. Ask how long the company has been in business and do some research on its past. Does it come highly recommended or have good reviews? Do they stand by their work and guarantee satisfaction? When mistakes occur, do they make up for them and handle those situations ethically? You want to know that the company not only knows how to produce good results, but that they actually care about you and your home. You don’t want a company that only cares about the money. Allowing anyone to work in your home is a risk, so you want to make the right choice with the right people. Do You Have Experience with My Brand? When hiring maintenance work, you want to know that the people you hire have direct experience with your brand of generator. Whether Kohler, Generac, GE, Honeywell, etc., the people you hire should know all about the intimate details of your generator. Each generator is different and will have its own quirks and ways of running. Ask questions about the brand, including how to monitor problems with your backup generator. You should ask a trustworthy professional questions about your generator. That way you can know for the future if it needs maintenance work, whether a big problem or small one. Sometimes you don’t need 24-hour maintenance service options. Sometimes you just need a kit change and warranty. Depending on your level of expertise, you might want to ask for a lower maintenance option, instead of paying for extra services you don’t need. Ask questions about what exactly is involved in your maintenance package, and make sure you’re only paying for what you need. The company you choose should want you to get the services you need for the best prices. They will want you to stay safe and not cut corners, but you should also have control of what services you want. Make sure there are no hidden fees or missing warranties involved in their services. While a regular checkup for your generator should prevent any major problems, accidents do happen. Sometimes your generator needs an emergency fix, because you want the generator to work exactly when you most need it. The best company should have available services any day and any time so you can ensure the security of your generator. If your generator does need an emergency fix, you want to know that factory-trained, certified technicians will arrive when you need them. You also want the flexibility to schedule your maintenance appointments when it’s most convenient for you. Bold Electric LLC provides quality Mountainside standby generator maintenance exactly when you need it. Family-owned and operated since 2005, our company offers the best brands in generators and the most qualified maintenance technicians for your homes and businesses. We treat our clients like our neighbors, and we believe that each of our neighbors deserves a standby generator to help in times of crisis, and a reliable maintenance system to keep the generator running when it counts. For more information on our generators and our maintenance options, visit our website or call 908-421-9157 today. If you own a Kohler generator, you’re already one step ahead to prepare yourself and your home for any emergency. Backup generators are extremely helpful to give you the energy you need during a snow storm, hurricane, or even a random power outage. However, even though you have your own generator, it does not mean the work is over. While you own a Kohler generator, you need to schedule Mountainside Kohler generator maintenance regularly. Problems never occur at a good time, so you want to be ready for anything. Read on for some reasons why you want to schedule regular generator maintenance sooner rather than later. Generators work hard to keep your home running when it’s most needed. However, if you ignore your backup until you need it, it will fail you. To keep your system running smoothly, you need to keep up with its checkups. Taking care of minor issues before they become big problems will save you time and money for larger repairs. Your generator is not a small purchase, it’s a large investment that you want to cherish. By taking the time to schedule regular repairs, you will become much more prepared for any emergency. Generator malfunctions usually occur at the worst possible time. 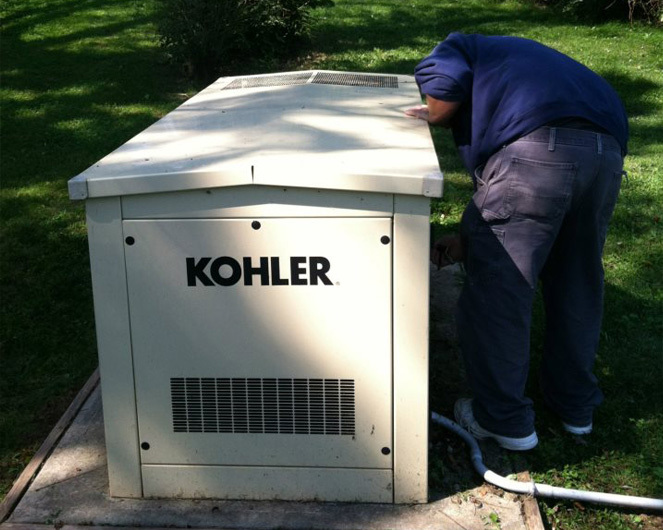 Make sure you limit any opportunities for problems by scheduling Kohler generator maintenance. As said before, your generator is not a small purchase. While you may not want to pay for the maintenance appointments that can feel unnecessary, allowing smaller problems to linger will only cost you larger repairs, or another generator sooner. You should check and listen to your generator regularly to see if anything is malfunctioning or damaged, but a professional can often detect problems that are not obvious to the untrained eye much faster. Unless you are confident you can fix the problem yourself, a professional will save you money to fix it, and will not cost you time you don’t have. A professional should also be covered by a warranty, and you can ensure a guaranteed job well done. This investment will help your wallet in the long run. Depending on the maintenance plan you choose, Bold Electric LLC can provide you with a wide range of coverage. These plans come with either annual or bi-annual checkup options, as well as kit changes, full service, and/or 24/7 monitoring. You have the flexibility to do more maintenance work yourself, or have a maintenance worker on call whenever you like. We can also perform warranty repairs if a larger problem occurs. Technology can be unpredictable, but we do everything in our power to help you minimize those unpredictable variables. We believe you, your family, and your home deserve to have the working generator you need exactly when you need it. Mountainside Kohler generator maintenance may seem unnecessary, but it is always better to be safe than sorry. We want to help you keep your home safe and running, and Kohler generator maintenance makes that possible. Each of our technicians is factory certified and equipped to maintain, test, and repair your generator any day, any time. We keep our technicians well-trained and refreshed to help them do the best job they can for you. Family-owned and operated since 2005, our company has reliably helped both New Jersey businesses and homes run smoothly. We genuinely care about your home, unlike most contractors. We prove this by always personally answering your phone calls every time. If you’re interested in signing up for one of our packages, or to just maintain your generator, visit our website or call us today at 908-421-9157.